On your next commercial glazing project you can rely on the dependable service of One Stop Glass. We will work closely with you to help you find the best glass solution for your project. 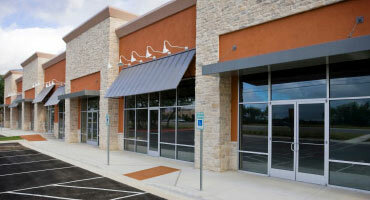 We can help you with the installation of storefronts, automatic door entries, and all your commercial projects. We can install storefront windows for a variety of buildings, offices, and industrial buildings. Let us help ensure the safety of your business while at the same time improving the look of your business. We strive to provide the finest quality storefront fabrication and replacement at a competitive price. Provide your customers with the convenience of an Automatic Door Entry system. There are several distinct types of automatic doors on the market in a number of configurations, developed for your specific needs. The new alternative to solid walls is glass walls and it is a top choice in dividing interior commercial spaces. It gives a feel of open office space while adding a sleek and modern visual design touch. We offer a range of colors and shapes so you get exactly the look you want! No matter what kind you have, we've got your glass covered! © One Stop Glass. All Rights Reserved.